"Short, sweet, and simple, this is a great example of stormwater management in residential settings. It gains a lot of environmental mileage for very little and sets a prototype for designers, policy makers, and neighborhoods. It works on every level, even traffic calming, and it even looks great with the existing landscape." 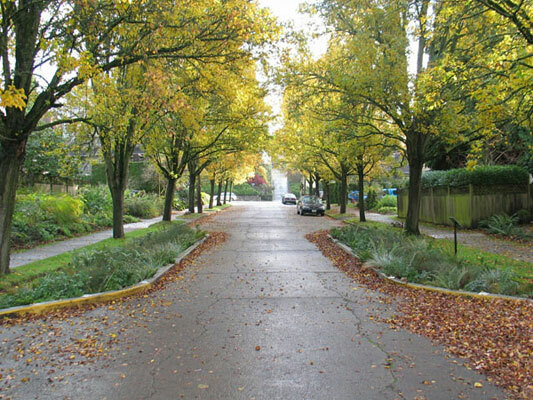 The NE Siskiyou Green Street is regarded as one of Portland’s best green street stormwater retrofit examples. The first of its kind anywhere, this project replaces the parking zone of a typical residential street with landscaped stormwater curb extensions designed to capture street stormwater runoff. Built in the fall of 2003, the NE Siskiyou Green Street project exemplifies the principles of sustainable stormwater management and showcases the value of simple, cost effective, and innovative design solutions. 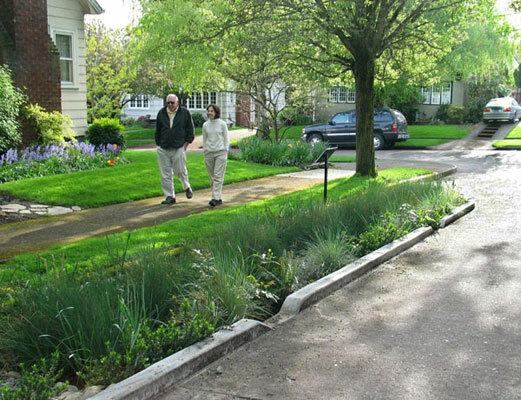 The NE Siskiyou Green Street project is unique to Portland and the United States in the way this quiet, 80 year-old residential street has been transformed to sustainably manage its stormwater runoff. 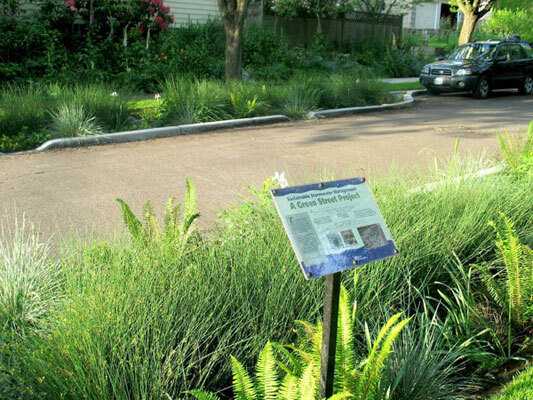 As part of the City of Portland’s commitment to promote a more natural approach to urban stormwater management, this “green street” project carves out a portion of the street’s parking zone and converts it into two landscaped curb extensions. Conventional curb extensions are often used for traffic calming and pedestrian safety. The curb extensions at NE Siskiyou Street share many of the same benefits of conventional curb extensions, however they are different in that they are also designed to elegantly capture, slow, cleanse, and infiltrate street runoff. Constructed in the fall of 2003, this street retrofit project demonstrates how both new and existing streets can be designed to provide direct environmental benefits and be aesthetically integrated into the neighborhood streetscape. Though this green street project maintains a strong functional component, it is the aesthetic appeal and intrigue of the new and improved NE Siskiyou Street that has the design community, developers, policy makers, and local citizens excited about green street design opportunities. Since its completion in 2003, the NE Siskiyou Green Street project has been a successful “catalyst” project by providing inspiration for the development of other green street projects throughout the United States. How does the NE Siskiyou Green Street Work? 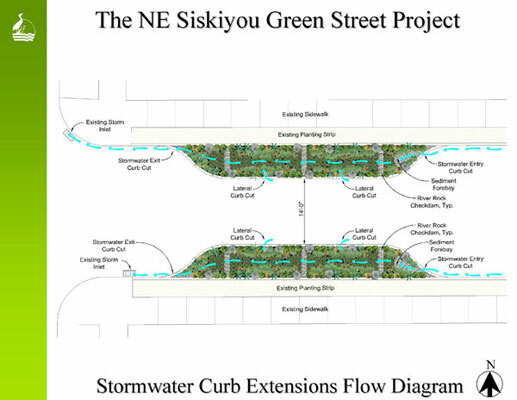 The NE Siskiyou Green Street project essentially disconnects the street’s rainwater runoff from the City’s combined storm/sewer pipe system and manages it on-site using a landscape approach. Stormwater runoff from 10,000 square feet of NE Siskiyou Street and neighboring driveways flows downhill along the existing curb until it reaches the 7-foot wide, 50-foot long curb extensions. An 18-inch wide curb cut allows this water to enter each curb extension. Once water is within the landscape area, the water is retained to a depth of 7 inches by a series of checkdams. 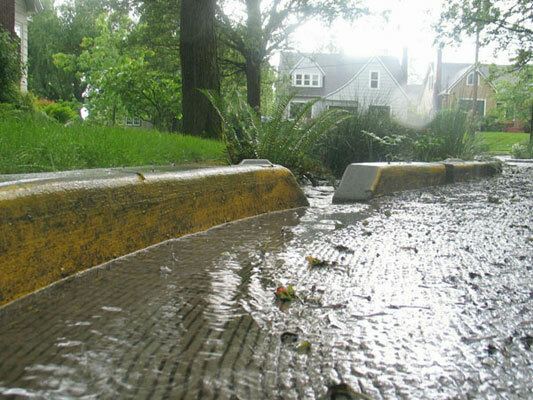 Depending on the intensity of a rain event, water will cascade from one "cell" to another until plants and soil absorb the runoff or until the curb extensions reach their storage capacity. The landscape system in place infiltrates water at a rate of 3 inches per hour. If a storm is intense enough, water will exit the landscape area through another curb cut at the end of each curb extension and will flow into the existing street inlets. With the new stormwater curb extensions now in place, nearly all of NE Siskiyou’s annual street runoff, estimated at 225,000 gallons, is managed by its landscape system. In fact, multiple simulated flow tests have shown that the curb extensions at NE Siskiyou Street have the ability to reduce the runoff intensity of a typical 25-year storm event by 85 percent. Where communities struggle with ever-increasing impervious areas and degraded water quality, these simple landscape approaches can have a measurable positive impact. Plants and soil are key functional elements of all landscaped stormwater facilities. 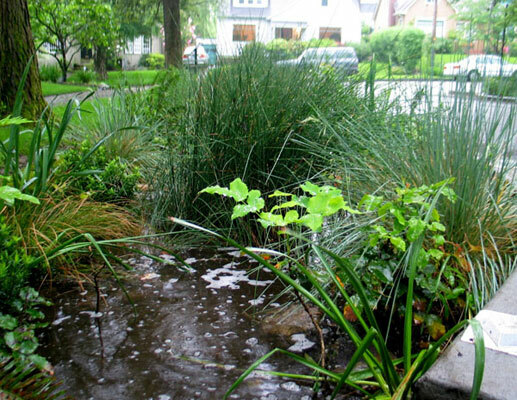 This natural system approach improves the quality of the urban runoff through bio-retention processes and helps restore lost hydrologic functions in urbanized areas. 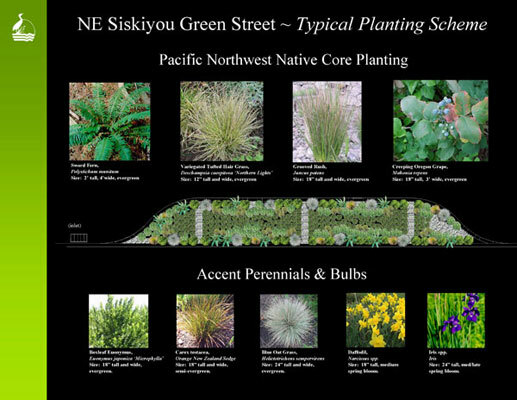 The plants selected for the NE Siskiyou Green Street are primarily Pacific Northwest natives, such as Oregon grape, sword fern, and grooved rush. Adaptable ornamental species such as blue oat grass, boxleaf euonymus, and New Zealand sedge, were also planted because these species are low-maintenance and fit very well in the neighborhood context. All of the selected plant species are low-growing evergreen varieties with varying colors and textures which always provide year-round interest. The native grooved rush (Juncus patens) planted within the shallow areas of each stormwater curb extension is the workhorse for stormwater management. The upright growth structure of Juncus patens slows down water flow and captures pollutants while its deep penetrating roots work well for water absorption. 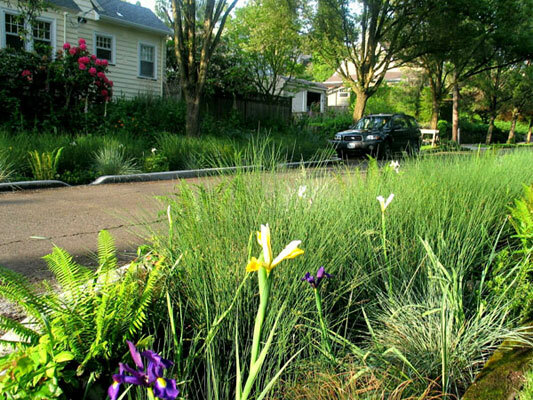 The highlight for NE Siskiyou Street residents each year comes at springtime when they see a collage of both daffodils and iris species blooming within the stormwater curb extensions, just as they do in their own front yards. Because The NE Siskiyou Green Street Project was the first of its kind, the design, coordination, and permitting with other City Bureaus took almost a year to complete. Public outreach to the residents was extensive to assure acceptability and consensus. The effort has paid off in terms of widespread community acceptance. In fact, the City now has a waiting list of Portland residents who want similar landscaped stormwater facilities built on their own streets. The fact that this is a publicly designed and constructed facility provides a unique opportunity to bring government together with its citizens in a creative and positive partnership. 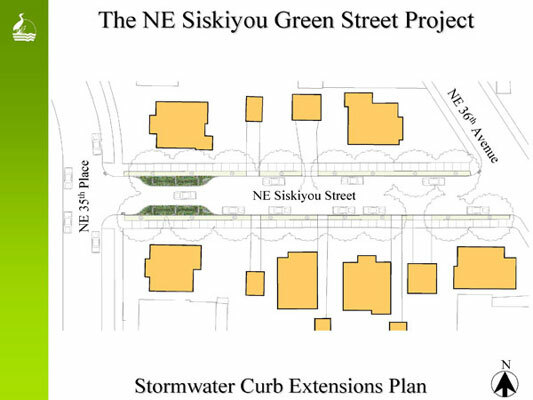 The NE Siskiyou Green Street project has achieved three primary goals: 1) it is low-cost in its design and execution; 2) it benefits the environment and embodies community livability; and 3) it provides a model for other jurisdictions in addressing important national and local stormwater regulations. These landscaped stormwater curb extensions are beautiful to look at and bring natural hydrologic functions back into the city. However to be a viable tool for innovative stormwater management, the NE Siskiyou Green Street Project needed to be relatively simple to construct, as maintenance friendly as possible, and cost effective. 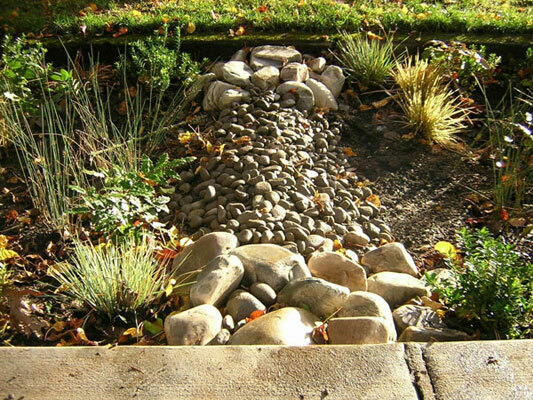 Using stormwater checkdams made out of packed earth covered with river rock is one example of a simple, attractive, and environmentally sustainable design element that costs very little to install. Cost effective solutions such as these allowed the project to be built for under $20,000. The success of neighborhood stormwater projects like the NE Siskiyou Green Street is dependent on community involvement. The residents were active participants in the design process. Multiple "street side chats" were conducted during the summer of 2003 to determine how much parking to remove and what planting schemes they desired, as well as to answer any questions and address any concerns. Communication with the neighbors continues to this day in the form of surveys and site visits to determine the overall success of the project from the neighborhood perspective. In a unique partnership, the City and the neighborhood residents have agreed to share responsibilities in maintaining the landscaped stormwater curb extensions. To further engage the community, a small interpretative sign has been placed at the project site to describe how the stormwater facilities function, as well as how to find more information on sustainable stormwater management practices. The aesthetic appeal and intrigue of the new stormwater facilities creates a community asset that promotes both environmental stewardship and education at the neighborhood level. The NE Siskiyou Green Street project has caught the attention Portland locals as well as visitors from all over the United States, Europe, and Asia who find this small retrofit project as an example to follow.